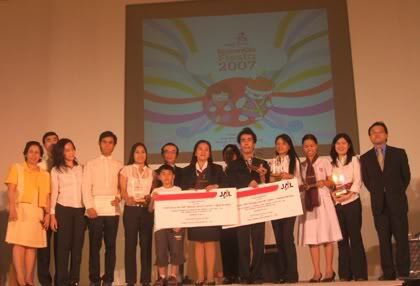 If I knew that the first prize for the 34th Nihongo Speech Contest, held last Saturday during the 2007 Nihongo Fiesta, was an all-expense paid trip to Japan (courtesy of Japan Airlines), I would have dug up my old speech piece and entered the darn contest myself! All I could do was gnaw at my bottom lip last Saturday as I trained my lens on the happy teary-eyed winners posing for both the amateur and professional photographers happily clicking away in front of them. Yeah, I was picturing that I was the one holding the gigantic JAL ticket on stage with H.E. Ryuichiro Yamazaki, the Ambassador of Japan to the Philippines by my side. It actually made the whole ordeal bearable. Bitterness aside, I’d just like to say congratulations to all the participants and most especially to the winners! You may have gotten the tickets, but I’m still pretty! The Japanese Association Manila, Inc.